Home > Bacteria & Antibiotics > What Are Antibiotic Resistant Bacteria? Antibiotic resistant bacteria are strains of bacteria that can carry on growing and dividing normally in the presence of an antibiotic that should kill them, or severely inhibit their growth. Antibiotic resistance started to develop shortly after penicillin, the first antibiotic was introduced in the early 1940s. Bacteria divide very quickly, as fast as once every 20 minutes, and so their rate of mutation can be exceptional. When they are exposed to an environment that contains high levels of an antibiotic, most bacteria die. However, a mutation in just one single bacterium that enables it to withstand the effects of that antibiotic can lead to a whole population of antibiotic resistant bacteria. The gene that confers resistance can then be passed between bacteria during conjugation. This is a process in which bacteria link up with narrow communication tubes and pass DNA between them through the tubes. It is a common mechanism by which antibiotic resistance spreads within and between species of bacteria. It explains why antibiotic resistance has spread so quickly and efficiently throughout the world. Several classes of antibiotics, including the penicillins and the cephalosporins have a chemical structure called a beta lactam ring. This ring structure must be intact if the antibiotic is to prevent cell wall synthesis in the target bacteria. Bacteria can become resistant to penicillins and cephalosporins by gaining a gene that produces an enzyme capable of destroying the structure of the antibiotic. The enzyme is often called penicillinase but its modern chemical name is beta lactamase. Over 200 different forms of beta lactamase have been described, all of which have different chemical structures but all of which carry out the same function. Bacteria that are able to resist the killing effects of chloramphenicol are able to destroy the antibiotic molecule using an acetyl transferase, an enzyme that removes all the acetyl groups and breaks the antibiotic apart. Other bacteria become resistant to beta lactam antibiotics by producing proteins that bind to the beta lactam ring, so that it cannot prevent cell wall synthesis. The binding protein in this case acts as a physical blocker rather than an enzyme that destroys the antibiotic. Some bacteria also change the proteins on their surface so that there are no entry points for the antibiotic. Methicillin-resistant Staphylococcus aureus (MRSA) has an altered penicillin binding protein that prevents any of the penicillin-like antibiotics gaining entry to the cell. Other antibiotic resistant bacteria have altered target molecules inside their bacterial cell. Bacteria that become resistant to trimethoprim do so because the target enzyme of the antibiotic is slightly different to the enzyme in wild type bacteria and the antibiotic cannot recognise it. Several species of bacteria have developed a molecular pump that moves the antibiotic molecules out of the bacterial cell faster than they can get in. E. coli and Pseudomonas aeruginosa are known to have multi-drug systems that move out many different antibiotics and drug molecules, preventing them from having any effect on the bacterium. Resistance to the tetracyclin class of antibiotics is now widespread in Enterobacteria and is due to a protein transport pump that uses energy to continually rid the cell of the drug. Antibiotics that act on a particular metabolic pathway, in which one chemical is produced from other in a series of small steps, can stop working if the bacterium finds a way to make the product via a different route. Sulphonamides work by preventing bacteria producing a vital precursor molecule for the synthesis of DNA. Sulphonamide resistant bacteria do not need this precursor, and use a readily available alternative. However, the most famous example of a bypass system is that seen in MRSA, which produces an alternative to the normal penicillin binding protein. This binds the antibiotics, but the binding event has no effect on the function or survival of the bacterium. 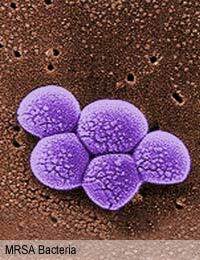 Linezolid, one of the newest antibiotics that is now reserved for treating MRSA was introduced in the late 1990s and the first strains of linezolid resistant Staphylococcus aureus were detected in 2003, just a few years later. Whatever antibiotics are produced and used, bacteria will develop mechanisms that can resist their killing effects.